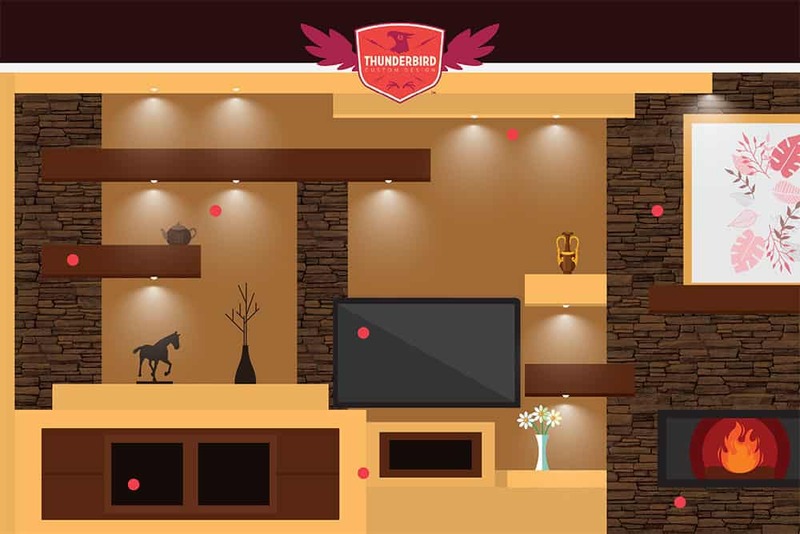 If you haven’t heard about a Thunderbird Wall or who Thunderbird Custom Design is, then pay close attention. 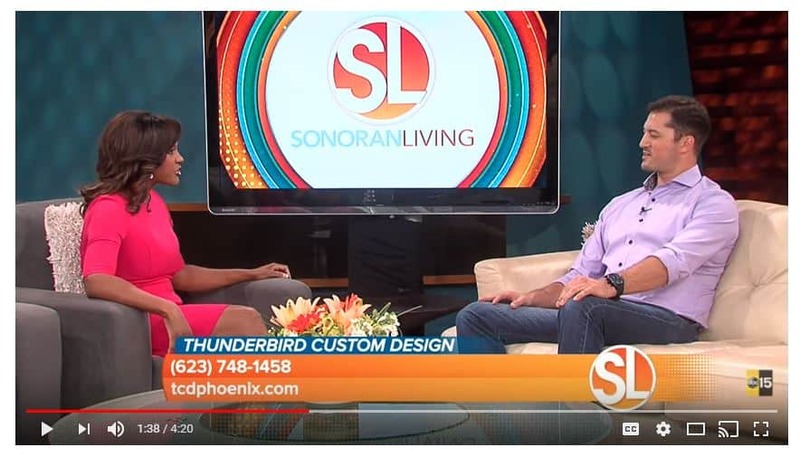 Thunderbird Custom Design is a media wall contractor, located in Goodyear Arizona, who designs and builds custom entertainment and media walls here in the valley. Their work and craftsmanship is so unique they’ve even trademarked their Thundebird Wall. We sat down with TCD’s owner Brandon Luna and asked him some questions that future customers might want to know. 1. How long has TCD been in business? We opened for business in April of 2005, so a little more than 11 years. In the beginning we were Thunderbird Custom Drywall. 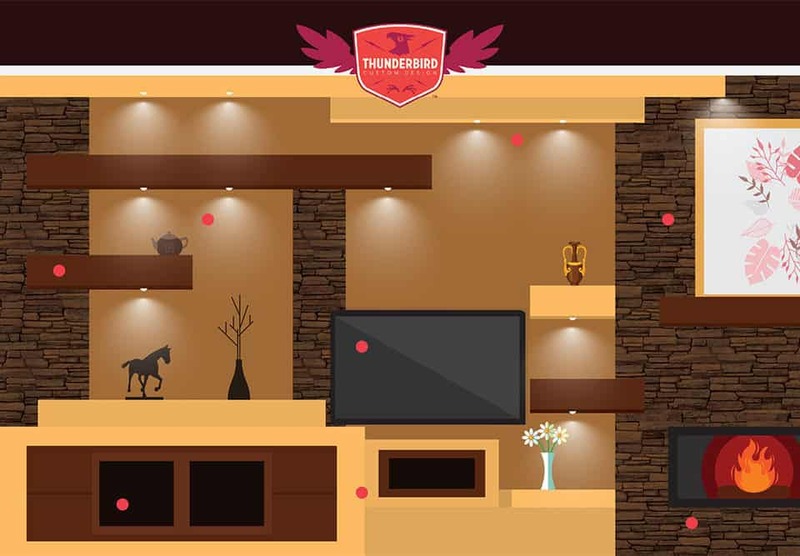 In 2009 we changed our name to Thunderbird Custom Design to reflect our growing business style and product because it was more than just drywall. 2. What makes you better than any of the other custom drywall / media wall contractor around town? I never like to say we are better than someone else. I like to point out what makes us different and let each client decide what is best for them. One thing that separates us from 95% of other contractors that may build is we are a one stop shop, which is really important to the vast majority of our clients. Most of them want one person to design, build and hook up AV so they can just sit down and turn on their TV and enjoy their new wall. For those other few companies that can do the same thing we do, our service is what makes us a distinct choice. We have been fortunate to hire a great group of guys that are true craftsmen and care about our clients homes and the fact that we are disrupting their daily routine by being there. Our office and sales staff are very knowledgeable and we help choose finish materials and colors. Our ability to stick to a schedule that we provide our clients flies in the face of what people think a contractor can do. Lastly, as a leader in this industry our designs are always innovating and leading the way for other ideas in design. We can use just about any material in our walls to accomplish a look or feeling our clients want to have when they look at their new space. Having a national trademark for the “Thunderbird Wall” helps people put their trust in our design team that we are going to come up with a design that they have been looking for. Some people have a hard time knowing exactly what they want or how to explain it and I feel we do a great job at picking up what is not being said and producing a design that they love. 3. Are you a part of the Arizona BBB and if so what’s your rating with them? 4. What kind of custom work do you provide? We are a speciality company, so we only build entertainment centers. 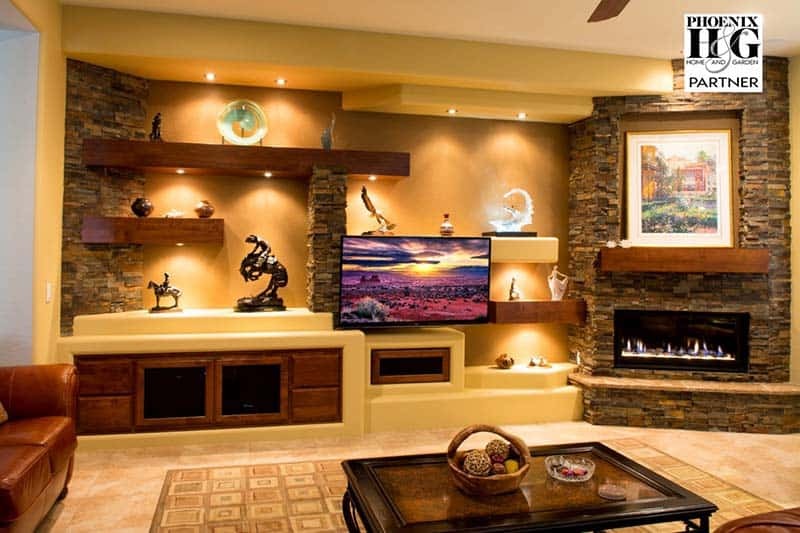 The Thunderbird Wall is our main product but we also build the traditional Media Walls and Wood Entertainment Centers while providing full service sales and installation of audio and video products. 5. What part of the valley do your service? Most of our work is spread all over Maricopa County. From Goodyear and Surprise to Phoenix and Scottsdale to Chandler, Mesa and Gilbert, and everywhere else in between. We also do some work in Florence, Casa Grande, Maricopa, Apache Junction and Gold Canyon, though not as often. We are getting to ready to grow down into the Tucson area in the near future. 6. How do you determine what kind of entertainment wall will be best within our home? One of our design consultants meets with our potential clients in their home because you really can not get a good feel for their style or the personality of their home if you aren’t there. It’s a simple meeting to go over their functional needs and style and show our portfolio to give them more ideas or confirm what they were already thinking. We rely on our experience to create a design that they ask for or need. There are however a lot of times we also put together a design they may not have even thought they wanted or needed but are happily surprised when we show them what we have come up with. 7. Do you provide any warranties with your work? 8. Are you guys involved with your community? We have made it a priority to help out in our community, and our success as a company seems to have followed the same path as our desire to help other people. I am personally in a group called The West Valley Mavericks, which is a 501c3 foundation that raises money for groups and people here in the west valley. We are also involved with Make a Wish AZ. We use our resources as designers, craftsmen, organizers, and financial support to help both groups. As a former professional baseball player I like to help youth sports organizations as well. I feel athletics has taught me a lot that has helped in my success and I want to be able to return the favor. It has been a very rewarding endeavor to help where we can. Watching our staff, subcontractor and vendors pitch in to help with a common goal gives us a great sense of pride as a company and as people. 9. Is your company licensed, insured and bonded? 10. Do you provide references? We get a lot of jobs through referral and most of our clients happily offer to talk to anyone that needs a reference from us. We have lots of thank you letter to show people if they ask. I would encourage people to search for references online as a starting point, I think they will he happy with what they find. 11. Do you have any pics we can view of your work and where? Our website www.tcdphoenix.com has a gallery. Houzz.com has pictures. We have a youtube video that will show some before and afters. Call us and have a design specialist come out and show you our portfolio, we like to reserve some of our work for people who call us into their homes. 12. How long does a typical project take to complete? It all depends on the job. It can be as little as a 1 day install for wood units, a week for just drywall, or two weeks for the Thunderbird Wall because of its different finishes. On average it takes 12 days to complete. We have a 3 week contract and provide a finish date for you so you know the project won’t drag on like construction horror stories you hear. If you’re thinking about remodeling your home or looking to add something unique to your family room, give our office a call. TCD would love to show you our Thunderbird Wall and what sets us apart from he rest. Call today 623-748-1458 or visit our contact section.